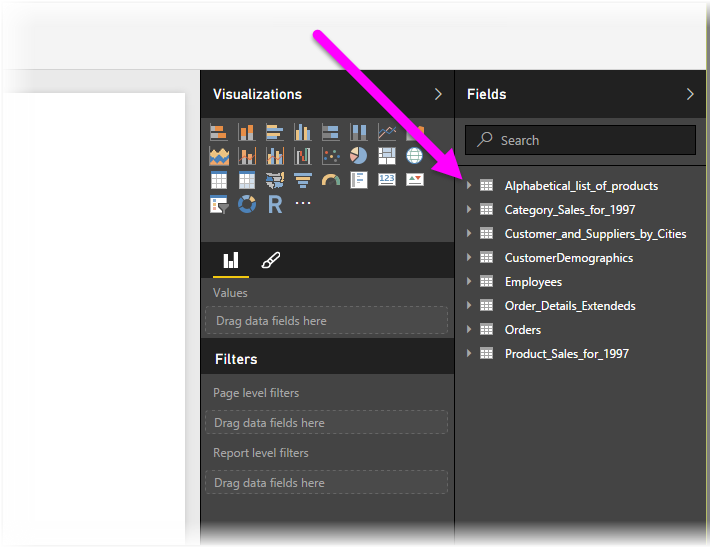 In Power BI Desktop, you can connect to an OData feed and use the underlying data just like any other data source in Power BI Desktop. 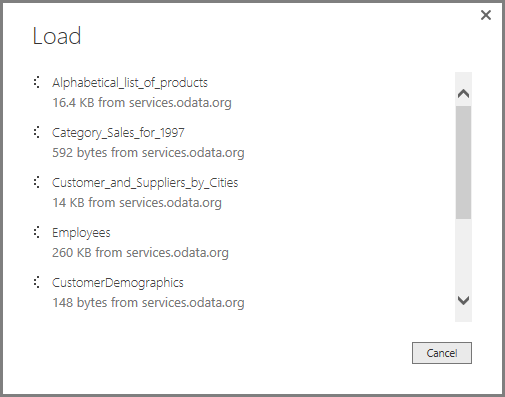 To connect to an OData feed, select Get Data > OData Feed from the Home ribbon in Power BI Desktop. 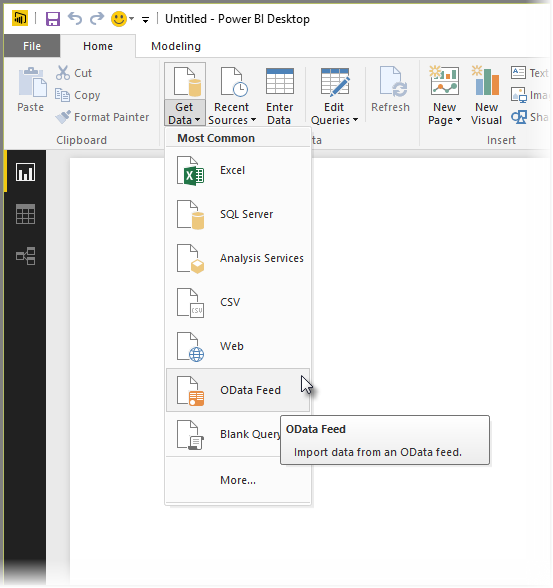 In the OData Feed window that appears, type or paste your OData feed URL into the box, and select OK.
Power BI Desktop connects to the OData feed, and displays the available tables and other data elements in the Navigator window. When you select an element, the right pane of the Navigator window displays a preview of the data. You can select as many tables as you want to import. The Navigator window shows a preview of the currently selected table. You can choose the Edit button, which launches Query Editor, where you can shape and transform the data from the OData feed before importing it into Power BI Desktop. Or you can select the Load button, and import all of the data elements you selected in the left pane. When we select Load, Power BI Desktop imports the selected items, and displays a Load window of the import progress. Once complete, Power BI Desktop makes the selected tables and other data elements available in the Fields pane, found on the right side of the Reports view in Power BI Desktop. 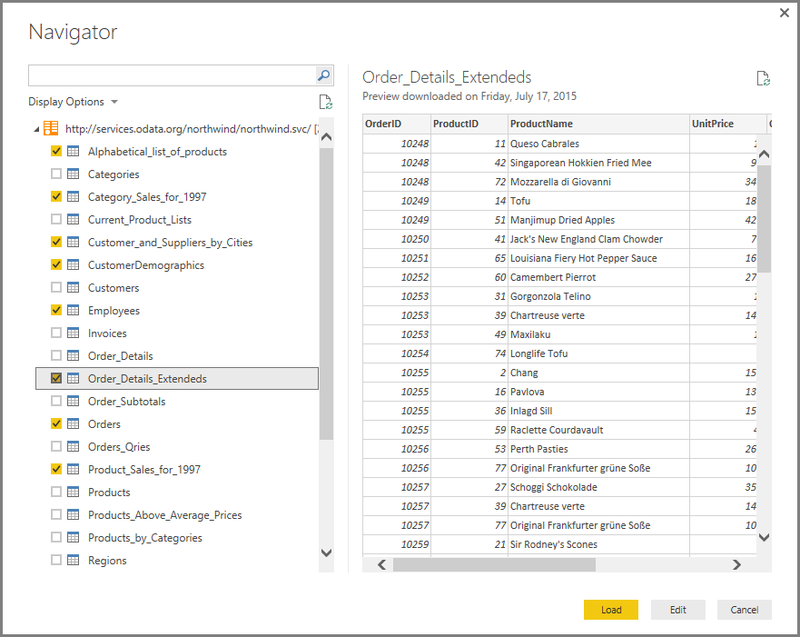 You’re now ready to use the imported data from the OData feed in Power BI Desktop to create visuals, reports, or interact with any other data you might want to connect with and import, such as other Excel workbooks, databases, or any other data source.